Professor Gao received his BS in Physics (1981) from the Central-South University of Technology, Changsha, Hunan, China, and his PhD in Physics (1986) from Purdue University, West Lafayette, Indiana. 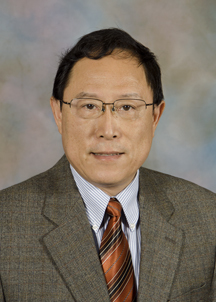 After a postdoctoral position in the Department of Chemical Engineering and Materials Science at the University of Minnesota, Professor Gao joined the University as an Assistant Professor of Physics in 1988. He was promoted to Associate Professor in 1994 and to Professor in 1999. Professor Gao's research interests lie in the general areas of Chemical, Biological and Condensed Matter Physics, and particularly in the area of Surface Physics. His research involves the investigation of physical phenomena at solid surfaces and interfaces by examining their electronic and structural properties. His recent work has studied the electronic interactions and morphology of interfaces and interface formation; the structural and spectroscopic properties of nanostructures; the transient behavior of charge transfer across interfaces; interfaces in organic semiconductor devices; and ultrafast dynamics of photoexcited electrons in solids. For further details, go to Professor Gao's home page at: http://www.pas.rochester.edu/~ygao. Phthalocyanine,” Appl. Phys. Lett. 92, 053309 (2008). T. He, H. Ding, N. Peor, M. Lu, D.A. Corley, B. Chen, Y. Ofir, Y. Gao, S.
Modifications,” J. Am. Chem. Soc. 130, 1699 (2008). Copper Phthalocyanine (CuPc) Induced by Intensive Na Doping,” Chem. Phys. H. Ding, Y. Gao, M. Cinchetti, J.-P. Wustenberg, M. Sanchez-Albaneda, O.
at the CuPc/GaAs Interface,” Phys. Rev. B78, 075311 (2008). two-photon photoemission,” Nature Material, 8, 115 (2008). (Taylor & Francis CRC Press, New York, 2008). Appl. Phys. A95, 89 (2009). Alkali Metal-doped Organic Semiconductor,” J. Elec. Spec. Relat. Phen. (8-hydroxyquinoline) aluminum (Alq),” Chem. Phys. Lett. 473, 92 (2009). of Conductivity in Organic Field-Effect Transistors,” Appl. Phys. Lett. Sol. E. Mat. Sol. Cells 93, 1688 (2009). Guillaume Vives, Byung-Chan Yu, Long Cheng, Austen K. Flatt, Priscilla G.
Molecules,” J. Org. Chem. 74, 7885 (2009). derivatives,” Synthetic Metals, 159, 995, (2009). Devices,” Materials Sci. Engr. Rep. 68, 39 (2010). films,” Appl. Phys. Lett. 96, 243307 (2010).